Running a company is one of the toughest jobs in the society. You need to become attentive while at the same time innovative in your on ways. Adapting a useful tool that helps you run a company smooth is a big plus. But, the question is, how can you do this? It is quite simple, make use of the technology to experience less work. Also, you will be able to save time and increase production. Releasing salary for your employees can be head-aching. Now, it is time to say goodbye from this burden with the use of payroll register template. You can also see Check Register Templates. This template is extremely applicable to a company. It has a plain, simple and customizable file. It comes with functional columns outlining the record of employees’ hours of works. 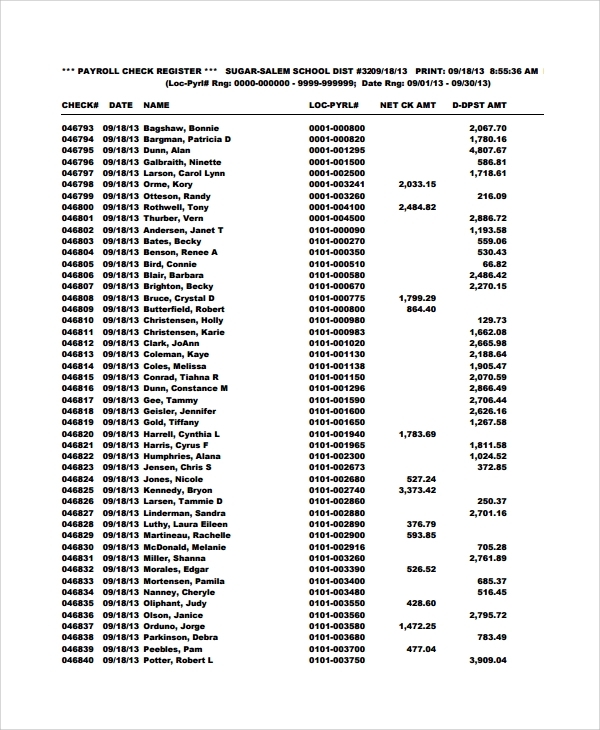 The file has 6 major columns: Employee name, total hours, earnings, current gross taxable, deductions, and payment. Under the Earnings column, there’s 4 columns: Regular, Overtime, Current Gross and YTD Gross. 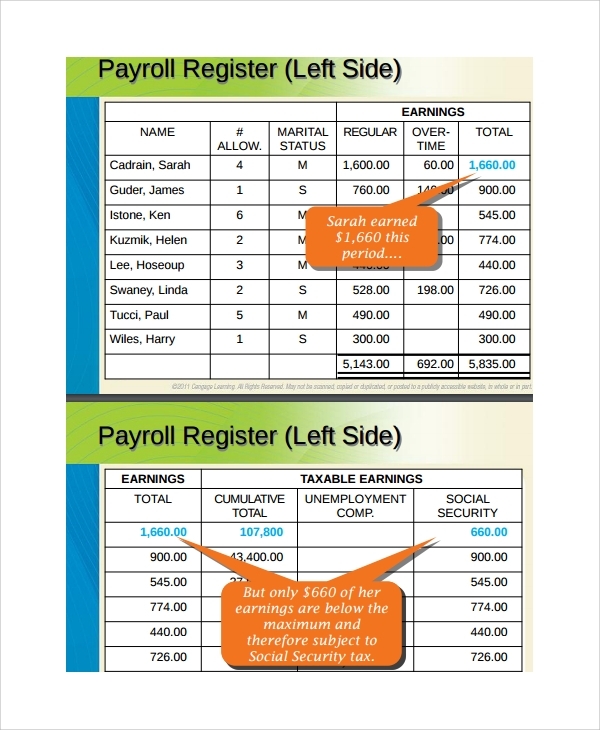 There is sample payroll register template that makes a lot of sense. You simply have to ready your calculator and do the calculation. 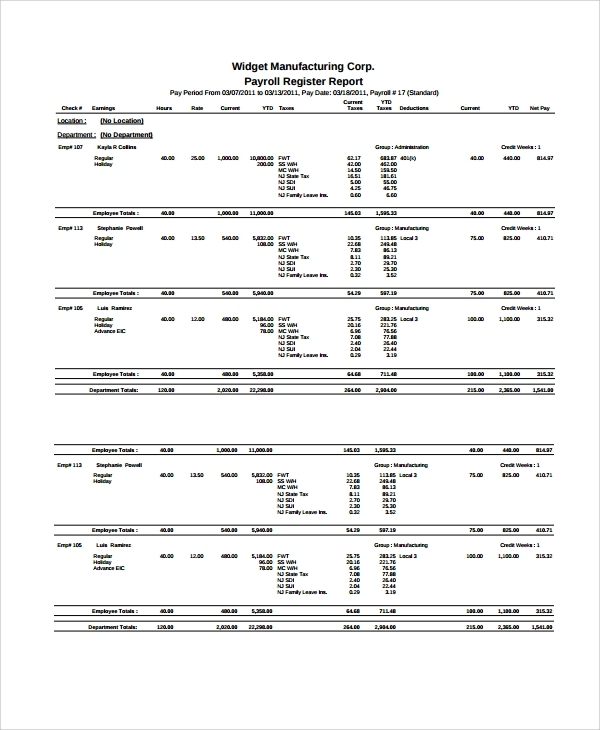 This template has unique tables which outlined the important details for the payroll. This template has 4 columns: Employee name, Hours and Earnings This Pay, Deductions This Pay, Other This Pay, and Check No. Net Pay. This template is very much simple, it includes the Check #, Date, Name, LOC-PYRL#, NET CK AMT and D-DPST AMT. 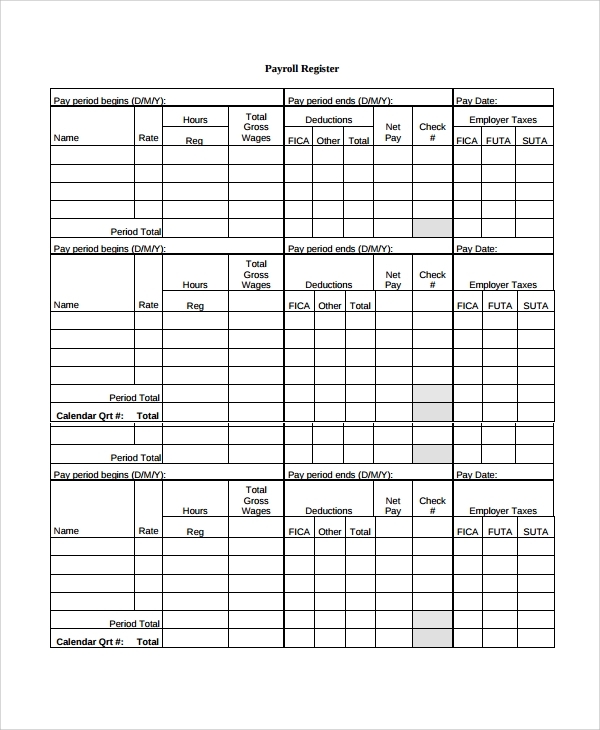 This payroll sheet is ready for the next payroll; very clean and simple to use. 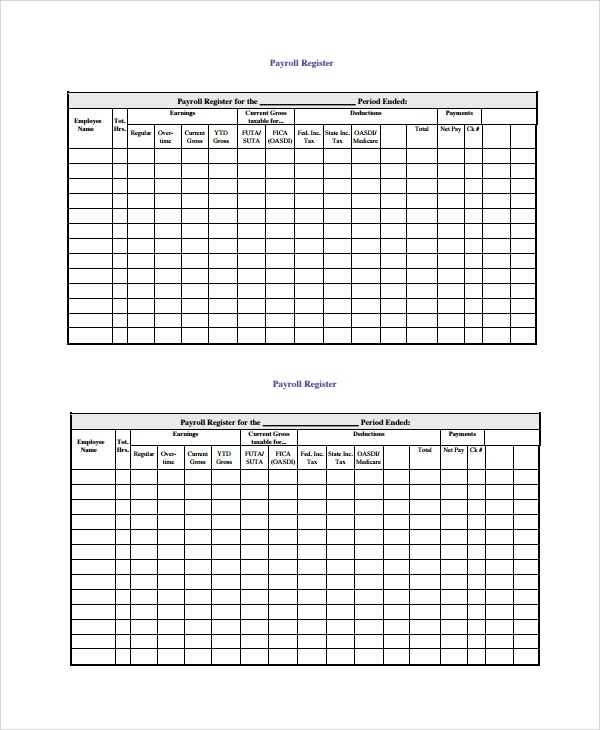 This template is a payroll sheet that is applicable to you. This is printed ready and downloadable for free. This file is offered for free to download and easy to use. Start to enter the employees’ information, salary records, deductions, and payments. This file contains the entire salary record from the first salary you received up to the present. Payroll register is a part of the business’ tools or materials. It is very important that you have the records of all the employees’ salary information. From the first salary up to the present should be recorded and in-tacked. A company needs to have this file as to the purposes of giving the right amount of salaries for their employees. 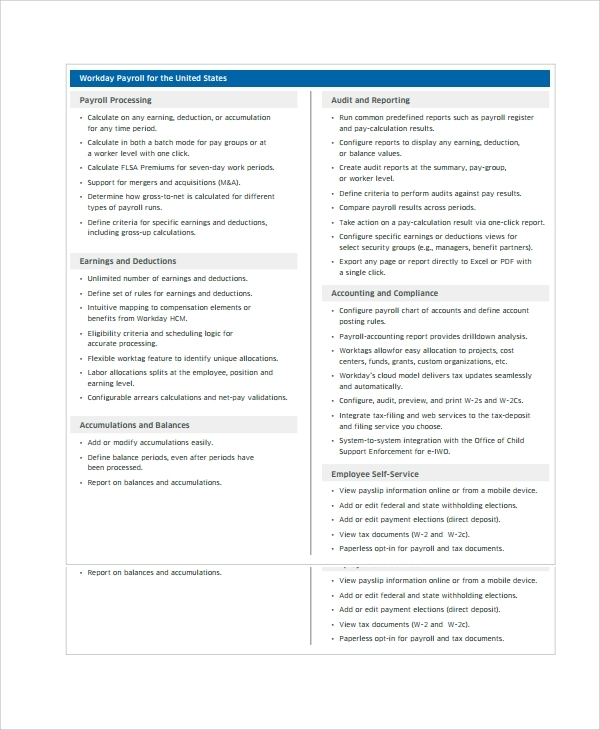 You can also see Accounting Memo Templates. When do I need a Payroll Register Template? If you own a business, you will need a payroll register template. If you are an accountant, you will definitely need this template. This will make the payroll organized, accurate and saved. So, a company should keep all the records of the employees’ salary for future use. There will be no problem once one of the employees would ask about his/her salary record. You don’t need worry on how you can present and explain how his/her salary calculated. Any deduction of the salary has a note or record on the template, which makes it relevant for both employer and employees. How to Create/Write a Payroll Register? Creating a payroll register is very easy and simple. You can simply use tables with rows and columns. Simply outline employee name, date, deductions, salary amount and the total salary to receive. There is no need to hassle yourself of making a cluttered payroll sheet. Just makes things simple like outlining the important salary information and do the payment. There will be possible additional columns that is integrated with the salary. Thus, it must be included on the outline to clear up things on the salary. 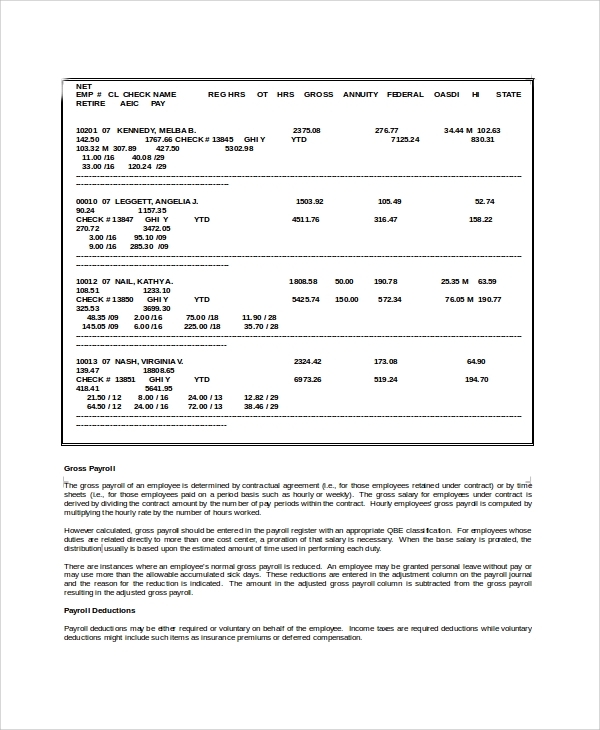 You can also see Cash Slip Templates. 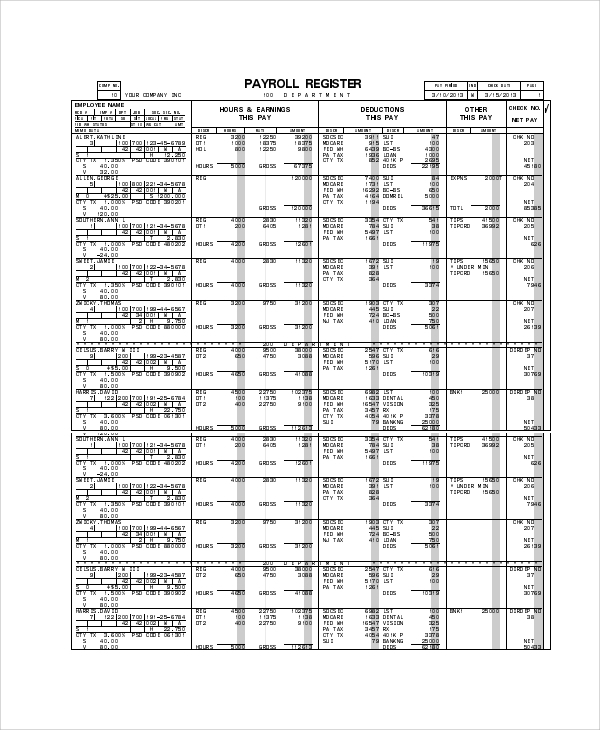 Payroll register temple is accessible on any search engines. You can simply key-in the keyword and search. You are able to get presented with a variety of doc and pdf files. With this, you can come up with a downloadable file for free. Also, it will be relevant for you, as it gives you a customizable and ready to print template.